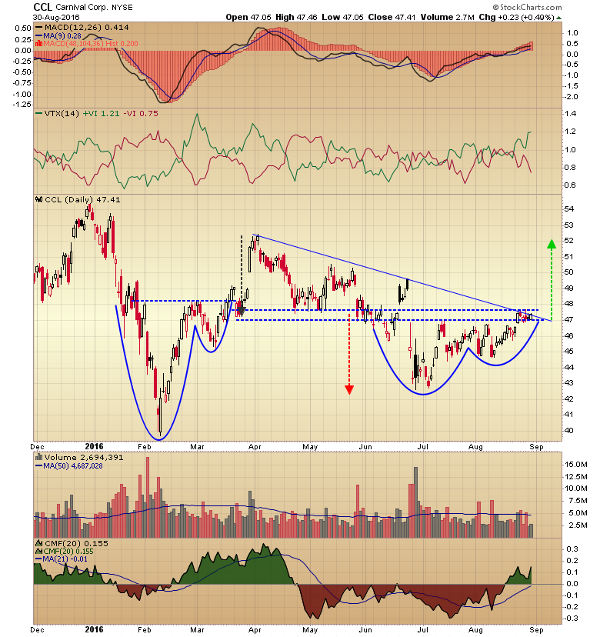 Carnival is breaking out of a cup and handle consolidation and ready to cruise higher. Shares of Carnival (CCL - Get Report) have experienced some choppy seas and serous headwinds this year, but the price action has calmed, and it looks like it is full speed ahead for the stock price. The action in the stock this year formed three distinct technical patterns on the daily chart. First was a deep cup and handle pattern with neckline resistance in the $48 area, and the stock did break above that resistance in March. The move that followed did not achieve the pattern price objective, which would have returned it to the old highs. Instead, it failed after achieving half its goal and then began making a series of lower highs above horizontal support in the $47.50 area. This movement formed the second pattern, a triangle-like consolidation. That pattern support was broken in June and this time price target in the $43.00 area was met. Since that time, the stock price has formed a third pattern, another cup and handle with rim line resistance currently intersecting with the extended downtrend line of the previous triangle pattern. The stock has been testing this reinforced zone of resistance this month, and the technical indicators suggest it is ready to break out. Daily moving average convergence/divergence is overlaid on a weekly histogram of the oscillator and is crossing above the center line on both timeframes. This reflects short- and intermediate-term positive price momentum. The vortex indicator is used to identify early shifts in trend direction, and while the handle portion of the latest pattern was forming, it oscillated in a narrow range with no clear signal. Last week it made a bullish crossover, and the positive line has continued to diverge from the negative line, with the implication that the stock is in the initial phase of a bullish trend. Chaikin money flow has moved into positive territory and is helping to confirm the positive price and trend indications. Carnival is a long candidate after an upper candle close above the $47.75 level using a trailing percentage stop. This latest cup and handle formation projects a price target that takes the stock back up to the March high.